Oregon Business - American College of Healthcare Sciences recognized as one of the 2019 Top 100 Best Companies to Work For in Oregon by Oregon Business Magazine. American College of Healthcare Sciences recognized as one of the 2019 Top 100 Best Companies to Work For in Oregon by Oregon Business Magazine. American College of Healthcare Sciences (ACHS), an accredited, online integrative health college based in Portland, Oregon has been recognized as one of the 2019 Top 100 Best Companies to Work For in Oregon by Oregon Business Magazine. This marks the third year ACHS has been honored with this distinction. Final rankings will be announced on February 28, 2019, at the Oregon Convention Center in Portland, Oregon (https://www.oregonbusiness.com/100best/companies). 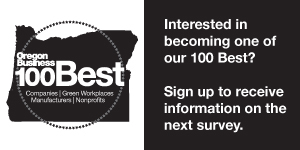 The much anticipated ranking of the top 100 Best Companies to Work For will be listed in the March 2019 issue of Oregon Business Magazine along with a countdown of the 2019 top ten companies. The rankings are based on the confidential input of employees who answered questions about workplace satisfaction such as benefits, management, trust, work environment and career development. The survey was voluntary and free of charge; results are independently calculated by research partner Checkpoint Surveys. ACHS policies reflect the value of each staff member to the overall team and demonstrate the social impact that thoughtful corporate policies can have in the workplace. Creating policies like our paid parental leave and telecommuting options help our valuable, trusted and committed long-term employees balance work, family, and other pursuits. In a knowledge-based industry like ours, that adds significant value, and that is the heart of the B Corp™ supporting the triple bottom line of people and the planet, as well as profits. ACHS was the first accredited higher education institution specializing in holistic health and wellness to become a Certified B Corporation®. Headquartered in the John’s Landing neighborhood of SW Portland, ACHS’s mission is to provide: professional online and on-campus education and high-quality natural products with a commitment to sustainable practices and principles. The college’s commitment includes a focus on green practices and principles to ensure a clean and safe working environment and to foster a culture of environmental stewardship within the office and the greater community. About ACHS- Founded in 1978, ACHS.edu is a Portland, OR-based, accredited college offering online, on-campus, and study abroad integrative health education. ACHS also has a satellite campus in Kona, Hawaii. With undergraduate and graduate degrees, diplomas, certificates, and continuing education units in integrative health, ACHS makes holistic health and wellness education accessible to a diverse community, including healthcare professionals, military students, stay-at-home parents, and lifelong learners. Specializations include aromatherapy, herbal medicine, holistic nutrition, and wellness coaching. ACHS is a Certified B Corporation® and was ranked five of 100 Best Green Workplaces in Oregon 2018 by Oregon Business magazine. ACHS was also honored with 2016 and 2017 When Work Works awards, administered by the Families and Work Institute and the Society for Human Resource Management, and received the City of Portland Sustainability at Work Certification in 2017. ACHS is accredited by the Distance Education Accrediting Commission (DEAC), which is recognized by the U.S. Department of Education and by the Council for Higher Education Accreditation (CHEA), and is also approved by the Office of Degree Authorization of the Oregon Higher Education Coordinating Commission and authorized by the Hawaii Department of Commerce and Consumer Affairs, Hawaii Post-Secondary Education Authorization Program (HPEAP). Visit achs.edu.